3D Scanning will take place at the Snite Museum of Art: Sculptor Ralph Helmick will create a public artwork entitled Edifice for the new Duncan Student Center. 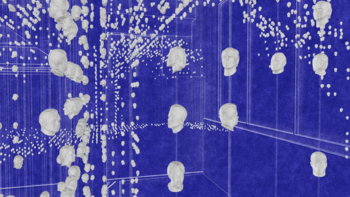 The sculpture will celebrate diversity at Notre Dame by featuring 4,100 suspended pewter portrait heads depicting Notre Dame students, faculty, and staff members. Have your head scanned to be included in this work of art. Monday, November 13, 10 a.m. to 6 p.m.
Tuesday, November 14, 10 a.m. to 6 p.m.
Wednesday, November 15, 10 a.m. to 6 p.m.
Thursday, November 16 from 10 a.m. to noon. One of Notre Dame’s best-known civic icons is the Main Building. Edifice is a surreal three-dimensional portrait of the Main Building, suspended in the Duncan Student Center, a setting experienced by students, staff, visitors and alumni alike. The sculpture can be understood as an architectural model rendered in light and shadow. Architectural surfaces onto which imaginary angled “sunlight” shines are articulated by a multitude of small elements precisely suspended on cables. Architectural surfaces in “shadow” are not articulated. 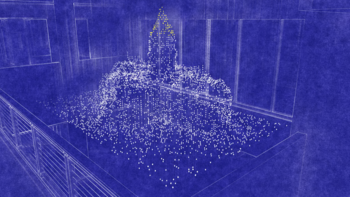 The surrounding ground plane is depicted as well, with voids where the building casts shadows. Each of the 4100+ pewter elements is a small realistic portrait of a member of the Notre Dame community. The total is comprised of multiples of at least 50 distinct portraits selected from 100+ individual scanning datasets. Most of the portraits are silver. Those comprising the dome have a golden sheen. Perspectives include views from 270 degrees around the sculpture on the second floor, a view through the glass wall of the adjacent conference room, and views up from the first floor café. Edifice’s goal is to engage viewers in an inclusive, generous, subtly spectacular esthetic experience, portraying a campus icon in a novel way while embodying Notre Dame’s commitment to diversity. Participants must be 18 years old and they must sign a waiver, release, and indemnification agreement. 2. Will every scan be used within the sculpture? Probably not. Helmick Sculpture will use as many as possible, but they are trying to reflect the diversity of Notre Dame. 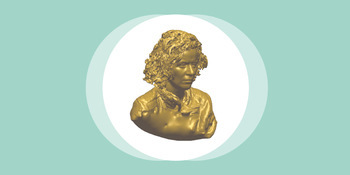 Out of 100 scans, they expect to create pewter portrait sculptures depicting 50 individuals. 3. How will the scans be made into sculptures? Scans will be outsourced to a service bureau that produces rapid prototypes (3D prints). When the prototypes are returned, they will be cleaned manually to remove any build lines. At this stage Ralph Helmick will further refine each portrait by hand. The finished prototypes will then be molded and cast in multiples in pewter. When the castings are delivered to the studio they will be cleaned, checked for quality, and receive finish coatings. Finally, the elements will be transported to the Duncan Student Center where Helmick and his team will meticulously string them on cables to create a dreamlike model of the Main Building. 4. Are their any restrictions? The turntable has a maximum capacity of 300 lbs. (Sitters will be asked to remove glasses, because scanner has difficulty reproducing eyeglasses?) Participants must be 18 years old and they must sign a waiver, release, and indemnification agreement. 5. Where can I learn more about Ralph Helmick and his sculpture?